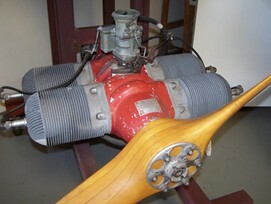 The 2-stroke 72 hp McCulloch target drone engine exhibited here is an example of a single-ignition system. There is one spark plug in each cylinder and a wire attached to it that comes from an electrical source. In the majority of small aircraft systems, the source of electrical power is a magneto. The magneto has a strong magnet rotating inside a wire coil which generates a voltage that is routed out to the spark plugs on the engine at the proper time. The electrical impulse arcs or jumps across a gap in the spark plug, carefully timed in advance, before top-dead-center, in the presence of a gasoline and air mixture. By contrast, in larger engines for manned aircraft, dual spark plugs fired by separate magnetos are common for redundancy and enhanced safety. On the checklist before takeoff, pilots test single versus dual spark ignition, and the prop RPM always drops when running on single-ignition. Among the drone aircraft using the McCulloch O-100-1 were the Radioplane Model RP-15 (OQ-6) and the MQM 33 (Q-19). Manufactured by: McCulloch Motors Corp.